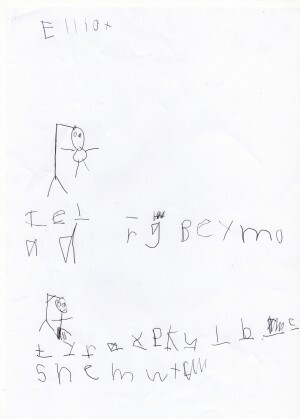 Have you ever played hangman with a 5-year old? It’s not easy. I’ve just tried it with Elliot, my youngest. It was his idea. I didn’t know he knew the game. He simply said he wanted to play a game, and left the room to get some scrap paper and pens. When he came back he wrote my name on one piece of A4 and his on another. He draws the gallows on his. “I’ll go first,” he says, and he carefully gets his pen into position in his little thumb and fingers and draws four small dashes, which represent the missing letters. “It’s an animal,” he says mysteriously. Hmm. Animal. Four letters. Then I see he has built my gallows already. “You can’t build that hanging thing yet,” I said. I haven’t started guessing. I’m a father of three. I’ve learned to pick my battles. I’m also an ex-teacher, so I decide that a spelling activity will flow better if I don’t get too hung up (pardon the pun) on when and when not to build the gallows. So I decide to let it go and start guessing. “/a/” I say, phonetically, as this is how he knows letters – as sounds. “No,” he says happily, drawing my head in the noose. Then he writes an a below so we know we’ve tried that letter and failed. He’s delighted. “No!” and draws in my eyes. They look like hearts. One is coloured in the other isn’t. Only a five-year old knows why. “/r/ “ I offer, knowingly. “Ha! No!” he shouts, and puts in my body which is smaller than my head. I’m confused. What is he thinking? “/e/?” I ask, now unsure how he spells tiger or if, indeed, it is tigr. But if not, what then? “Yes!” he says, and goes to write in the letter. I’m reassured. At last, I ponder. It is tigr but he’s probably not thinking about the r for whatever reason. After all, he only started reading and writing this year. It’s amazing that we are playing a spelling game like this at all. However, things become confusing again when he puts the e as the second letter. This gives me Te _ _ . Can he be thinking tiger is somehow tegir? tegr? Does he actually know how to spell tigr? Now I really wonder if it’s tiger at all. He’s loving this. He’s already drawing some of my limbs on my hanging torso. “Do you give up?” he asks, hopefully. “No,” I say. “And stop drawing my arms. I haven’t said anything. I’m not dead yet” He laughs. I look again, as if looking harder at the paper will make everything fall into place. “/g/” I try. Surely this will work? “Nope.” A leg goes in. He draws the letter below. Fail. “No.” He doesn’t even blink. He starts laughing again. He’s in a world of his own. He has all the power. The odds are stacked against me. It’s like playing in a casino. More laughing. Then he writes in an l. Tel_? Telephant? Are we playing made-up animals? “Yes. Your turn.” He doesn’t seem the slightest bit apologetic. I’m still staring at him. I smile patiently and then take my pen and do five dashes. “It’s a fruit.” I say, happy to get the game back to normal. I know it’s a fruit and I know how it spell it. This can be the way to show him how to play the game properly. I’m in charge. “/j/” he says. What fruit is he thinking will have j in it? “No! Ha!” I say, impersonating his own tone of menace, as I draw a gallows from the bottom up. I know hangman almost as well as I know my animals, so I tell him the rules are about making lines for the gallows and then I hang him. I hear myself explaining this and notice how sick all this is. Who thought of this originally? A spelling game for kids? Really? Anyway, Elliot accepts the rule because he just wants to keep guessing. Damn. He’s got the first letter. He’ll guess it for sure. I’m shocked at myself for feeling a little disappointed. “/p/” he says, as soon as I put in the first letter. Damn. He’s got it already. I can see him read app_ _. “Apple!” he cries and punches the air as if he’s just won Wimbledon. “Yes. Well done.” I guess I was pleased for him after all. The guilt subsides. “My turn.” He swiftly says. “OK.” I feel unseasy. I feel the power snatched back from me. He takes his pen and draws four dashes. “It’s a fruit.” He says. I look at him. My face is asking if he’s sure it’s a fruit and not something else - like a verb! “Go on,” he prompts me, impatiently. This makes him laugh. He pushes his hand down on his head. “I’m keeping my hair on.” He demonstrates. “Very good. Now….” and I’m trying to think of a fruit with four letters which a five-year old knows about. Or can spell. Cherry? Too many letters. I doubt he knows that one. Lime? That’s got four letters, but I know for sure he doesn’t know lime. We live in Glasgow and I’m pretty certain he doesn’t drink margaritas. Then my wife walks in and sees we’re playing hangman. “So I’ve noticed,” I reply without looking up. He laughs at his own cunning and is clearly pleased with himself. I look back at him. And I look at the page where I have, in all obedience to the rules, been trying to see this as a fruit in four letters. Then I look back at him once more. We both know it is. Then I see something I have never seen in hangman before. As it dawns on me he has not only switched topics on me once again mid-game, he starts adding lots more dashes. Lots of dashes. In fact, I watch his lips move as he draws dashes for as long as it takes for him to whisper tyrannasaurus rex to himself. “Yes, I can,” he replies, but he’s giggling so much he can barely do them in a straight line. But I know it’s futile. I give him the correct letters in the correct order to spell tyrannasaurus rex but he’s not listening, but instead chuckling and writing any letters which occur to him and he hangs me anyway. That is the real game, of course. Winding up your dad and drawing something to get a reaction. I look at this finished result. We have a fruit which is actually a dinosaur called a tyraxpkylbc and a hanging body. But this time it’s different: my eyes are wide open and I’m smiling. So his spelling isn’t great, but his drawing is spot on.